Pitch Black is an excellent little horror film in which shipwrecked crew and passengers try to survive a swarm of luxophobic monsters. While it wasn’t a huge box office success, Pitch Black had enough of a cult following that director David Twohy and star Vin Diesel were able to produce a sequel. That sequel, The Chronicles of Riddick, has been in theaters since Friday. But between the two films, several years are missing. Dark Fury, released today on home video, tries to bridge that gap. 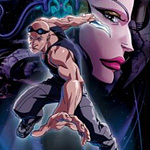 The Chronicles of Riddick: Dark Fury is an animated movie, voiced by live-action actors Diesel, Rhiana Griffith, Nick Chinlund, and Keith David. Twohy wrote the story, but left screenwriting and directing duties to others. At just over 30 minutes, it’s not feature-length, and it’s a little too long for TV. But the owner of this ship isn’t in it for the money. Independently wealthy, Chillingsworth (Tress Macneille whose voice can also be heard on The Simpsons) is trying to improve her art collection. She believes that killing is an art, and her collection consists of heinous murderers, frozen into statues by a metabolism-slowing drug. Riddick has been on her “acquire” list for some time. Naturally, Riddick has other ideas about how to spend the rest of his life. Dark Fury does a lot of things. It expands the universe created in Pitch Black, introduces an important character (Toombs), and easily allows tricks that are difficult and costly to capture in a live action film such as weightlessness, densely filled cavernous spaces, and alien monsters. Ironically, what it doesn’t do well is what it sets out to do, namely, bridge the gap between Pitch Black and Riddick. It does begin where Pitch Black left off, but it only explains a few days of the five years between the two films. The most important thing it does is merely to exist. By offering fans two stories in one week, Twohy clearly hopes his universe will become the next major sci-fi franchise. Comic books, role-playing games, action figures, and more movies and videos can’t be far behind. I’m sure the nerd and geek communities appreciate the effort. And while I wish the Riddick franchise the best of luck, as a part-time nerd, I’m a little cynical about a glossy, expensive, multi-front marketing campaign foisting Riddick’s world on me, rather than letting the world evolve in its own time. For a straight-to-video release, Dark Fury has a surprising cache of extra features. Bridging the Gap includes interviews with Twohy and Diesel. Animatic to Animation shows an edited storyboard sequence used as a working template for the animation. Into the Light is an interview with Diesel and Twohy recalling their first inklings that Pitch Black could be expanded. The Mind of an Animator features director Peter Chung talking about his approach to Dark Fury. None of these extra features are outstanding. They allow those involved to congratulate everyone else and hype the movies. For fans of the series and for aspiring animators, they do provide some background, but they don’t offer any striking insights that make the movies better or more respectable. Picture and sound are completely unblemished, as there is no archival material to restore. The picture on the screen reveals that a lot of care and work went in to making Dark Fury. Backgrounds are well realized and filled with the texture of light and shadow. Chung uses perspective; camera angles; and a good mix of closeups, medium shots, and wide shots to ensure the movie never looks flat. Quick movements are stylistically blurred, avoiding the choppiness of animation. The movie is widescreen-formatted, and sound is encoded in Dolby Digital Surround.